Ensure that your Asphalt Driveway Paving project goes smoothly and you get the finished driveway you are looking for. Help keep your Asphalt Driveway Paving project on time and budget! Order now and Immediately Download the Asphalt Driveway Paving Bid Sheet today. The Asphalt Paving Bid Sheet costs only $11 and is 100% guaranteed. Free Customer Support & Service with Purchase! The 15 page, Asphalt Driveway Paving Bid sheet includes a request for proposal (RFP) / Checklist form that you submit to prospective general contractor(s) for them to complete and provide back to you for review. The RFP form consists of over 45 questions on all aspects of the asphalt paving of your driveway. 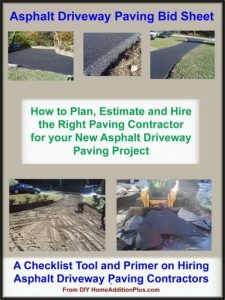 In addition, the Asphalt Paving Bid Sheet provides extensive and important advice to you on how to work with a paving contractor and his subcontractors in order to ensure your driveway is paved the way you want it to be. Types of asphalt paving methods and recommendations on thicknesses of the Sub-base layer, Base layer, and Asphalt lift layers. The Asphalt Paving Bid sheet also provides estimated asphalt paving costs and time estimates. existing home and building a new one in its place. I wrote about my experiences with this project, and in 2005 the DIY Network (a premium cable television network) filmed a show featuring this project. The show was part of a series and was titled “Be Your Own General Contractor – Vacation Homes”. About the Author: Mark Donovan was a contributing writer to the Weirs Times, a state wide newspaper in New Hampshire. He has also written hundreds of articles on home improvement projects, and his Vacation Home Project was featured on the DIY Network’s Be Your Own Contractor Vacation Home Series in 2005. Over the past 30+ years Mark Donovan has been involved with building homes and home additions. His projects have included: building a vacation home, building additions and garages on to existing homes, and finishing unfinished homes. If you are unsatisfied with this Bid Sheet email us and we will issue you a complete refund, no questions asked. If you have any questions regarding this bid sheet, or with your specific construction project, feel free to contact me and I will try to answer your questions. I normally respond within the same day.